Sustainable urban development in India needs a strategic path. The existing landscape provides a grim picture of urban development. For instance, the High Powered Expert Committee led by Isher Judge Ahluwalia in 2010 estimated that an investment of nearly ₹39 trillion would be needed for developing urban infrastructure to requisite benchmarks over 2012-2031. As per the McKinsey Global Report on India’s Urban Awakening, India’s existing urban population is slated to increase two-fold in the next three decades, thereby creating a mounting need to manage cities and to improve service levels of city infrastructure. Realising the need, Government of India has sharpened its focus on urban development through the launch of various flagship programmes such as the Smart Cities Mission and Atal Mission for Rejuvenation and Urban Transformation. As the Smart Cities Mission and other urban development initiatives roll out, tracking their progress, assessing city performance in a comparative perspective and monitoring the level and usability of services in cities become absolutely essential. 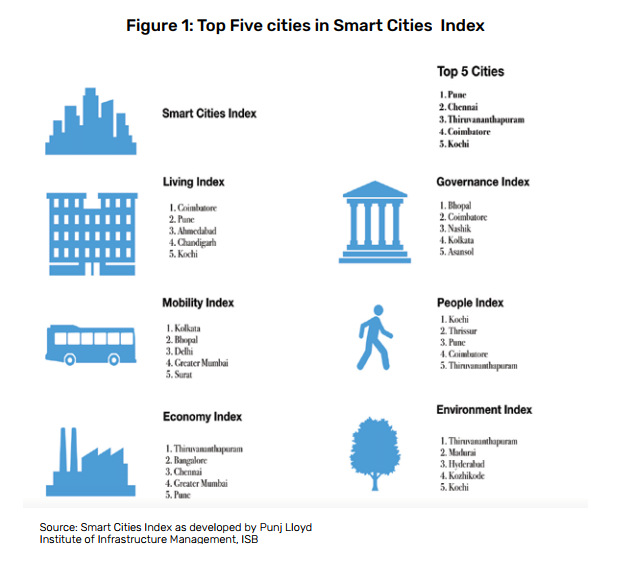 It was to address this gap that the Punj Lloyd Institute of Infrastructure Management at the Indian School of Business developed the Smart Cities Index. The Smart Cities Index study provided a framework that ranks cities based on an assessment of the level of services. The Smart Cities Index measured the quality of services of 53 cities with a population of more than one million, across 58 indicators for six different characteristics. The 58 indicators represented 34 factors that were then combined to form six urban characteristics: Living, Economy, People, Governance, Mobility and Environment. These indicators were developed after series of consultations with government organizations, academic institutions and think-tank initiatives. As the Smart Cities Mission and other urban development initiatives roll out, tracking their progress, assessing city performance in a comparative perspective, and monitoring the level and usability of services in cities become absolutely essential. Living represents the quality of life and availability of basics services. Governance represents the responsiveness of the urban local body and its service quality. People represents the level of education and inclusiveness of the residents of a city. Economy represents the extent of economic opportunities that a city offers. Mobility represents the ease with which people can move around within city and can access jobs, education etc. Environment represents the air quality and the use of sustainable practices. Figure 1 explains how these characteristics map on to the factors. Figure 2 provides a more detailed mapping of characteristics, factors and sample indicators. South Indian cities fared much better than their north Indian counterparts. 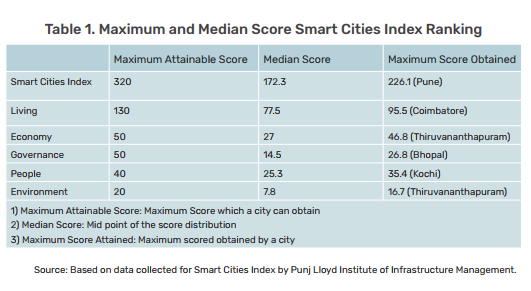 Interestingly, not one of the million-population cities from the states of Uttar Pradesh, Bihar and Orissa matched the median score of either the overall Smart Cities Index ranking or the six characteristics rankings. The Smart Cities Index analysis highlights the performance of Indian cities as of the year 2015-16. Pune tops the overall city ranking, followed by Chennai, Thiruvananthapuram, Coimbatore and Kochi. South Indian cities fared much better than their North Indian counterparts. In all of the characteristics, South Indian cities outperformed North Indian cities with the exception of Delhi, Kolkata, Chandigarh and Bhopal. Interestingly, not one of the million-population cities from the states of Uttar Pradesh, Bihar and Orissa matched the median score of either the overall Smart Cities Index ranking or the six characteristics rankings. Even cities such as Lucknow, Allahabad, Patna and Jamshedpur ranked in the bottom 20 of the Index, thus stressing the need for a more strategic approach towards urban development in North India. Some of the Tier-II cities performed better in the index compared to the Tier-I cities. For instance, Tier-II cities such as Thiruvananthapuram, Coimbatore, Kochi and Chandigarh ranked 3rd, 4th, 5th and 7th on the Index, respectively. Tier – I cities such as Chennai, Kolkata, Hyderabad, Bangalore and Greater Mumbai ranked 2nd, 6th, 8th, 9th and 10th on the Index, respectively. None of the cities had readily available data for all the 58 indicators. With the exception of few cities such as Bhopal and Mumbai, the majority had at least two to three indicators missing for a given factor. Most of the cities had numbers missing on factors such as Efficiency, Urban Planning, Disaster Management and Finance, especially on the broader Governance characteristics. One of the indicators, the Disaster Management framework, could not even be included in the ranking methodology, as more than 40 cities lacked this information. This indicator was intended to shed critical light on cities’ preparedness for disasters and their level of resilience in the event of natural or man-made disasters. More surprisingly, cities also lacked data on such administrative variables such as staffing adequacy calculated on the basis of the number of certified town planners in Urban Local Bodies (ULBs) per one lakh population, or on public access to the ULB´s finances, a binary variable captured by the existence of an audited balance sheet of the ULB in the public domain. Cities also lacked data on such administrative variables such as staffing adequacy, calculated on the basis of the number of certified town planners in Urban Local Bodies (ULBs) per one lakh population, or on public access to the ULB´s finances. Even Pune, which ranked first on the Index, had data missing for one indicator, namely the Maternal Mortality Rate missing on the Living characteristic, and another indicator Voter Participation in Last Municipal Election missing on the People characteristic. Delhi, the National Capital, lacked data for four indicators in Governance. These included the Number of Certified Town Planners working in the ULB, Capital Expenditure of ULB per lakh population, Percentage of revenue of ULB to state total revenue and percentage of non-revenue water. Similarly, in Living, data for three indicators were missing – Percentage of Population with Potable Water Supply, Percentage of Road Network with Covered Storm Water Drains and Percentage of Incidences of Road Flooding in a year. The nonavailability of this data caused Delhi to rank 16th on the Index. Similarly, other Tier – I cities likes Chennai, Kolkata, Hyderabad, Bangalore and Greater Mumbai also lacked data for at least one indicator. One possible reason for the better performance of some Tier-II cities, such as Thiruvananthapuram, Coimbatore, Kochi and Chandigarh, relative to Tier-I cities could be the availability of more data points for these Tier-II cities. For example, Thiruvananthapuram only lacked data for three indicators in Governance and two indicators in Living. However, since the study has used the percentile ranking methodology across the indicators, missing data points could not have significantly influenced the skewness of the ranking. One possible reason for non-availability of data could also stem from ULBs not collecting this information, or not putting such data in the public domain. Although Right to Information (RTI) applications were filed during the data collection phase of the Index, the ULBs were unable to furnish the required information. 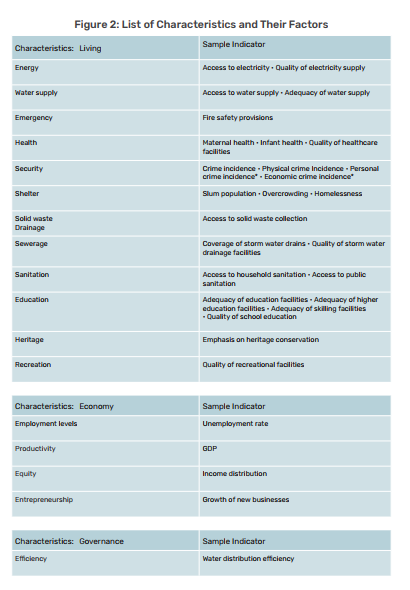 However, it is evident that in each of the characteristics, there is tremendous scope for improvement even for the top-ranked cities as Table 1 shows. In the overall ranking, with a total obtainable score of 320, top-ranked Pune just managed to obtain 226.1. Pune was not even in the top five cities in Governance, Mobility and Environment indices. On Mobility, the city was not even in top 10; it ranked 12. The city scored very high in providing the majority of basic services like water supply, sewage, and sanitation. It scored very high on Economy, but it has areas for concerns as well. The city has a mediocre personal crime per incidence score. With 0.06 certified town planners working in the ULB per one lakh population, Pune scores very low on the number of certified town planners. If this is the case of the top-ranked city in India, conditions elsewhere can be expected to be much worse. On all the six characteristics, the median city has managed a score which is just above the half of total attainable score. More worrisome, on two characteristics, Governance and Environment, the majority of cities have managed to score significantly less than half of the total attainable in the respective characteristics. This indicates the size of the effort required on multiple dimensions of urban development for Indian cities. In more than one way, such indices force city officials to take note of their deficiencies and learn from their peers to improve upon them. Going forward, such indices will encourage city officials to create repository of data banks and update it on a real-time basis [sic]. This will lead to greater transparency and accountability for city officials as well as elected representatives. 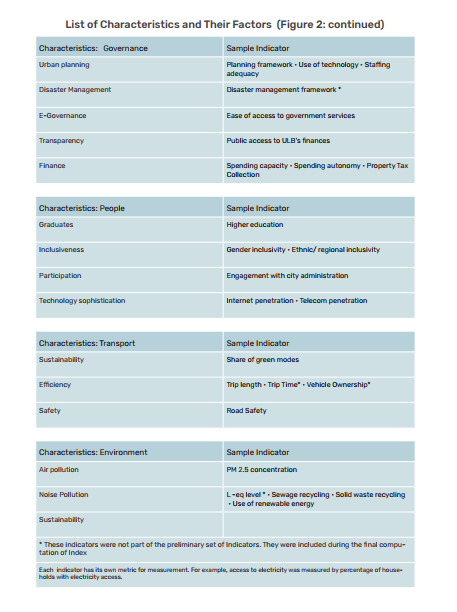 The Smart Cities Index stands alone in terms of its comprehensive framework. More such indices are needed to create healthy competition among the cities and to monitor city progress over time. The Government of India has recently taken the initiative of developing an index for measuring the quality of life in cities. But in order for more of these indices to be available to Indian cities to monitor and cross-check their performance, a more conscious effort is needed by local governments to create performance metrics for cities and collect data on them on a regular basis. 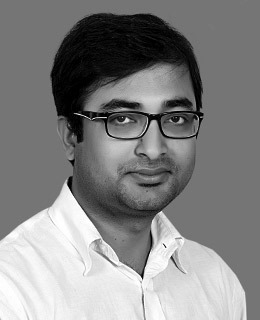 Ashish Mohan is an Analyst with Punj Lloyd Institute of Infrastructure Management at ISB. He was the lead researcher for the Smart Cities Index. 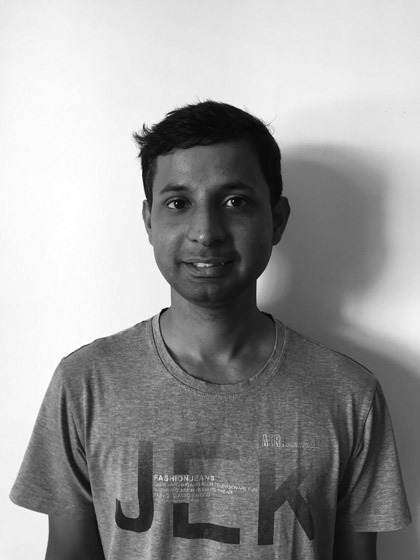 Tryambakesh Kumar Shukla was a Teaching Assistant and Analyst with Punj Lloyd Institute of Infrastructure Management at ISB. He is now with World Vision International.